There is a great consensus and also recent studies published in Spain that indicate that the structural industry sector problems are the capital and work productivity, in addition to a high energetic cost. Gaps in the product traceability, a need for improving the design, reduction of inactivity times and cost reduction. All challenges must be conquered investing in information technologies and promoting innovation with the use of the latest technological advances. 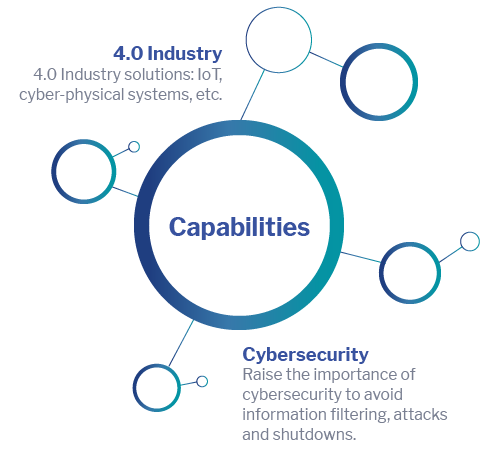 Industry 4.0. solutions have arrived to redirect strategies and takes us closer to achieving our objectives. dedicated to the clothing and automotive sectors. for the digital transformation applied to the sector. Applications able to safely interact with a vehicle. Corporative information analysis system for the distribution area. Vehicle connected with satellite communication.